Jerome Sydenham knows how to take the most out if his different activities. His different jobs -DJ , producer, A&R (headhunter ) for Atlantic Records, and now boss of Ibadan Records- have given him a wide range of skill and influences that have enabled him to forge in the last twenty years his musical identity. 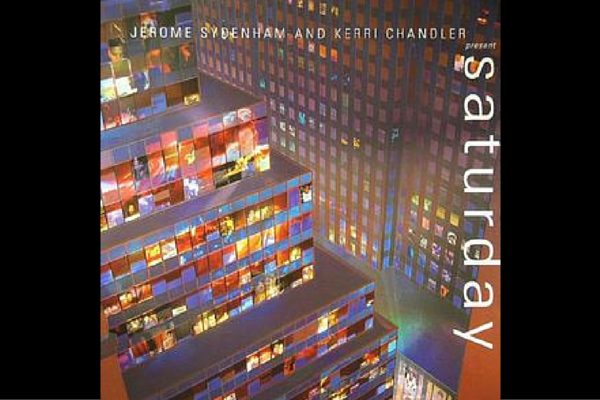 His LP Saturday produced with Kerri Chandler (among others artists), is the exact illustration of this ability that Jerome Sydenham possess to dig within him and around him to produce music with character. Track by track this LP walks us through the artist’s repertoire. Right from the start « Kò Kò », brings us on tracks with some pacy maracas as well as a base guitar with a simple but effective chord. Quickly cymbals as well as a line of percussion are added, making the track shift from a light sound to a club oriented one. Right from the start a clap brings energy to the track. The structure is relatively simple, but nonetheless efficient. The track is bouncy and has the mixture of exotic and trippy sounds, that we often hear in Jerome’s music. We recognise here the artist’s taste for afro-house, which he created in the 90s along with his mates « the classis guys » as he calls them: Joe Claussell and Kerri Chandler. But unlike other artists within this genre, Jerome skilfully avoids the mistake of making a music too dense, characterized by a multiplication percussions. He manages a smooth blend of Cuban and African sounds, with a minimalistic atmosphere. The second track « Candela » produced with Kerri Chandler, is the perfect illustration of Jerome’s mixed background with both New Yorkan and African influences. Jerome Sydenham grew up in a town called Ibadan in Nigeria. His record label now bears the name of his birth town thus acknowledging the relevance of this origin for the artist. Indeed, the track begins with a drum that sounds like it could have been directly recorded in some kind of live act directly in Ibadan. Globally this track keeps the light atmosphere so emblematic of this LP, as demonstrated by the very progressive construction of the music. The first part of the track is very lounge, but is quickly overshadowed by the bass that brings a new and more powerful phase. The tracks thus moves from something very mellow to a little afro-house bomb. This it typically the kind of music that brings momentum back to a tired crowd. One of the quality of « afro-house » is that it produces the same effect as classic techno but has more originality and authenticity. Whilst, listening to this kind of music, one might even realise that tribal drums are the ancestors of modern techno beats. Indeed, this track feels like it is just a dance floor oriented version of classic tribal music, thus showing how modern music has roots that go way deeper than techno. On the B side of this records, we can listen to « Rising the Sun », one of the all time classic of the two artists. For once, it seems that the track’s name is related to its sound, as the global atmosphere here is a little bit lighter and « sunnier » than in the previous ones. The sound is also a lot more deep-house. No African sounds are found here. Just a common snare and kick, followed by a line of beats that remind me of some of Glenn Underground’s productions. The tasty part of the track comes from the flute’s sound, which sounds like it’s coming from another planet, when compared to the rest of the music. Following this we can hear « Beat Down ». The transition is raw ! There is no introduction here. Straight away we are plunged to our neck in a very powerful techno track with a massive beat. This minimalistic techno sounds reminds us straight away of the label Ostgust Ton, on which Jerome Sydenham as remixed a couple of productions. We can feel here the growing influence of Germany on the artist, that will eventually move his base to Berlin in 2007. The first track of the second vinyl, « Winter’s Blessing » , starts in a pretty common way, but after a few seconds the classical parts of the piece (snare, bass…) are sublimed by a deep piano chord, but surprisingly sweet and worm. This ambiance both cold and reassuring, echo’s the track title, like it does for « Rising the Sun ». Composed of lightly sour sonorities, mixed with storm strikes, that come to bite our eardrum, like a winter morning’s effect on the skin. Something surprisingly pleasant comes out of this track, one of the most original of this LP in terms of construction. The different phases within the same production allow the two artists to keep us alert while playing along sensually. On the same face, we can listen to « Jehlaz » , named after the singer. This track is produced by Dennis Ferrer, a New York artist. Although the atmosphere respects the minimalist tone of the vinyl, Jehlaz’s voice contrasts with the rest of the LP. The vocal’s pretty sweet tone, gives the impression to be sometime in the presence of a solo, sometime of a chorus, evoking gospel or voodoo. When flipping the vinyl, you can find « Àrò » , produced by Jerome Sydenham, and eight other artists. Kerri Chandler is put in charge of the “traps” while Brian Lynch and Jordan Mclean are the trumpeters. The brasses (trumpet, trombone, saxophone), percussions, and strings (electric guitar by Dominique Kanza) give the global impression of a live Jazz concert somewhere in a West African capital in the 70s. There was, and still is in this part of the world a very dynamic, “Jazz like”, musical stage which is reflected here. Jerome Sydenham deeply marked by the musical, and festive life of his family in Ibadan is probably looking to reproduce in his own way this sound aesthetic. The LP ends then on « Deconstructed House (phase 1) »produced by Jerome Sydenham and Dennis Ferrer featuring Jania for the guitar, bass and vocals parts. The track begins on a pretty groovy house with swinging beat, and brief vocals characteristic of modern house. The ensembles maintains however some Latino sonorities, especially thanks to the guitar. The track gives the impression of an after during the Rio Festival, and we can almost associate it to the remixes of Cesaria Evora by Joe Claussell. Unlike most of the people in the musical world, Jerome Sydenham puts the business at the service of music, and not the other way around. This explains why he has been scouting artists, since his early days at Atlantic Records and now for Ibadan records, thus allowing him to produce this kind of LP gathering 17 artists from different styles and horizon. Jerome Sydenham is at this extant a double pioneer of the Afro-house style. First of all as a Dj and producer, because his productions contributed to bridge the gap between the South and the North to create a unique sound, but also as a manager by giving the opportunity to artists such as Joe Claussel, Dennis Ferrer, and Kerri Chandler (to mention only the most famous) to play and release exotic vinyls. This mix between several artists gives the LP his flavour reminding us of the different origins of modern house Jazz and African music, and it is probably one of the most appreciable thing about this vinyl.